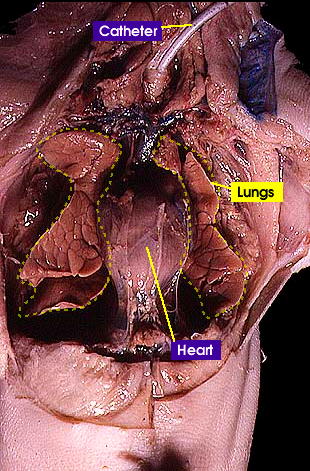 In this view, the thoracic cavity has been opened to show the trachea, lungs (outlined with dashed yellow line) and heart (on the midline and encased in its transparent pericardial sac). To make them more clearly visible, the lungs have been inflated with air via a catheter inserted into the trachea. In their natural state, each lung is encapsulated by a pleural membrane (not visible in this photo).